I love iced coffee, especially vanilla iced coffee! Making cold brew coffee is easy, but does require a little planning as the brew will need time to steep. Grind enough coffee to measure 4-ounces, I use a simple kitchen scale. Place the ground coffee into a 2-quart pitcher and fill the pitcher with fresh water. Stir the mixture to make sure all the beans are wet. Now for the hard part. You have to wait. Cover the top of the pitcher and let it sit at room temperature for at least 8-hours, I just leave mine overnight. The next morning, run the steeped coffee through a fine mesh strainer. Discard or compost the coffee grounds. Finally, run the coffee through the strainer again, only this time add a layer or cheesecloth to make sure you are catching any small grounds that might have snuck through the first time. Now you are ready to add the finishing touch! I use vanilla coconut milk creamer for my iced coffee. The vanilla flavor is already slightly sweetened, so I don't need to add sugar. This batch makes about 8 cups of iced coffee, so I split mine into 4-cups each. I added vanilla creamer to the first half and original creamer to the second half. I didn't need to add sugar to my vanilla batch, but the original version needed sweetening. This is a personal preference and you can adjust the sweetness according to your tastes. 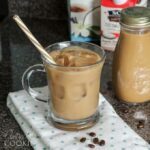 This recipe for Cold Brew Iced Coffee was printed from AmandasCookin.com - https://amandascookin.com/cold-brew-iced-coffee/ and can only be printed for education or personal use.